Don't bother waiting for city workers to clear the sidewalk in front of your house - that's your job. Western Washington has been under attack from relentless snowfall, and our best defense is a shovel and bag of salt. Snow-covered sidewalks, like the roadways they border, have become a serious danger for people trying to travel. Sidewalks are a necessary right-of-way and can be difficult for people, especially those with disabilities, to navigate when covered by snow and the ice hidden underneath. Don't bother waiting for the city to clear the cement walking paths because it's actually not their responsibility. Homeowners are required to clear the sidewalks in front of their property. The rules may differ from city to city, but most echo the same truth: It's your job to clear the sidewalk in front of your home. The Seattle Department of Transportation (SDOT) spells out the law clearly: "Property owners are responsible for maintaining the sidewalks adjacent to their property. They must make sure snow and ice does not pose a hazard to pedestrians." Tacoma says residents are supposed to clear their sidewalks within 24 hours of snowfall. 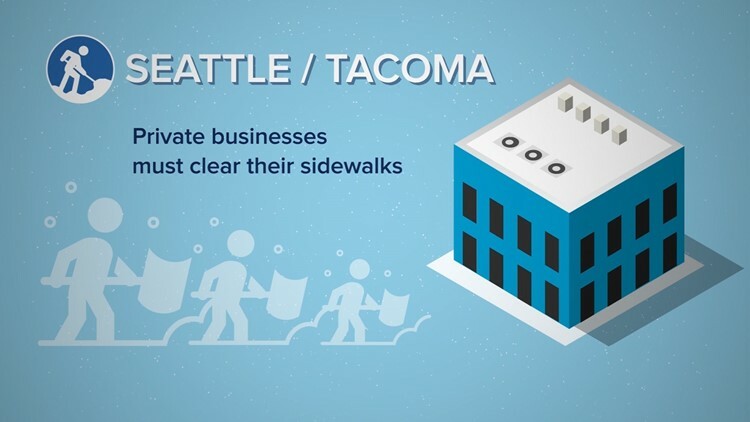 Same goes for businesses -- both Seattle and Tacoma say private businesses must clear off their sidewalks. First – pre-treat pavement with salt or brine before the snow starts. But if it’s too late for that - work smarter, not harder. “Get out and scrape what you can. Might not get it all, but over a couple days you can work it down. Then once you get it cleared, do a final layer of chloride to keep it from refreezing overnight," Al Riedmann told KING 5, who owns Seattle Snow, a private snow and ice control company. Riedmann recommended against putting only kitty litter or sand down on fully-frozen ice. If the ice is semi-melted, Riedmann said it's a different story. He also said when temperatures stay below freezing for several days, salted surfaces can refreeze. During a cold spell like this, he recommends mixing three parts grit – like sand or kitty litter – with one-part salt. Residents living in a townhouse or condo community should check with their homeowner association to see who is responsible for clearing sidewalks.